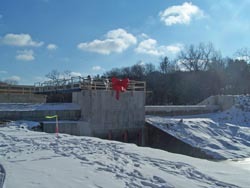 An early Christmas present for the people of Lake Delton. 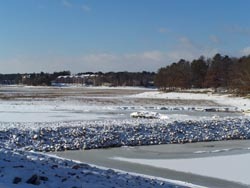 Less than six months after heavy rains caused a breach in the lake that drained it, water is returning to Lake Delton. Governor Jim Doyle on Friday dedicated the repaired section of Highway A that was washed out by the floods. Doyle says it&apos;s amazing the work was able to be completed so quickly. He says it is a strong statement of what can be achieved when everyone comes together. Getting Lake Delton ready to be refilled involved re-building the section of shoreline breached by flood waters and re-configuring the lake&apos;s dam. Doyle says it was an effort between several state agencies and local officials in charge of Lake Delton and the Wisconsin Dells tourism industry. Officials hope to have lake levels restored by next spring. The lake will be filled to an average depth of about seven feet over the next few months and then monitored. The plan is to allow melting snow in the spring fill the lake up the rest of the way.